Have you thought about freelancing, or already started to build your freelance skills and business network? CareerOneStop offers food for thought on aspects of freelancing to consider. A freelancer, or freelance worker, is self-employed, sells their work or services by the hour, day, or project, and may work for more than one employer at a time, or different employers sequentially, for short terms. Freelancing appeals to some people as a means to use their unique set of talents fully, in ways they can’t seem to do in a standard job. Some like the independence of setting their own schedule, taking time off when needed, and working extra hours when they have the time. Others like the opportunity to earn a higher hourly rate of pay than they could as an employee. Some people get into freelancing after a layoff, quitting—or being fired from a job. They may want a break from the obligations of regular employment, have a hard time finding a job, or just need an immediate income source. It’s common to build a freelance career over time, establishing relationships with clients and developing a network of business contacts that can provide leads for projects and freelance jobs. Reputation is key, as word of mouth referrals are like gold for freelance work. 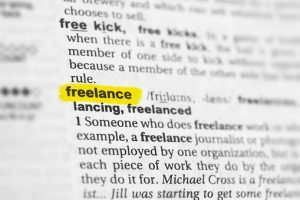 Freelance work may be posted on major job websites as well as on niche freelance work sites for writers, designers, developers and coders, photographers, marketers, and more. Social media may be especially helpful for digital media freelancers, and for outreach to develop contacts and establish links to your portfolio. Are there passions that freelancing will allow you to express, explore, and expand? What are the work environments you understand, in which you thrive, and to which you are able to make an immediate contribution? How will you keep up in your field to continue to offer in-demand skills? Most freelancers have a targeted skill set they’re marketing, so maintaining and refreshing that skill set needs to be part of the plan. Look for ways to keep your skills sharp such as sources for free or low-cost classes and software instruction or consider a skill training swap with someone who knows something you’d like to learn. Community college classes and certifications may be good options. Teaching your skills is another way to keep them sharp and build your reputation as an expert in the field. Your product may best be communicated through a portfolio of your work—considered essential for most freelancers, so keep a record of your projects, publications, a client list, successes, and accomplishments to include. Freelancers need to be aware of the costs of providing health insurance, retirement, and other benefits for themselves. For some, this may be the deciding factor in whether they can afford to freelance. Freelancers also forego unemployment insurance, so during gaps in employment, you are on your own. You may want to establish a reliable fall back income stream, such as a job you can easily pick up when needed. Freelancers may also need to pay for their own equipment, tools, and other gear. But unless items are essential for a particular project, you may build up your tool kit over time. Emotional support is a factor that some freelancers neglect to consider until its absence is felt. Many employees who work in teams and have longevity in a job develop close relationships with coworkers. This may not be part of a freelancer lifestyle, so you may want to take an honest look at how your social needs will be met by other means. Options could include joining freelancer networking groups, scheduling regular meetings with friends, or establishing yourself as a regular at a gym, favorite coffee shop, or volunteer gig. Employers may have unrealistic expectations of freelance workers and impose workloads and deadlines that leave little time or energy for a life outside of just keeping up. In cases like these, freelancers may need to assert their conditions to make the work sustainable.